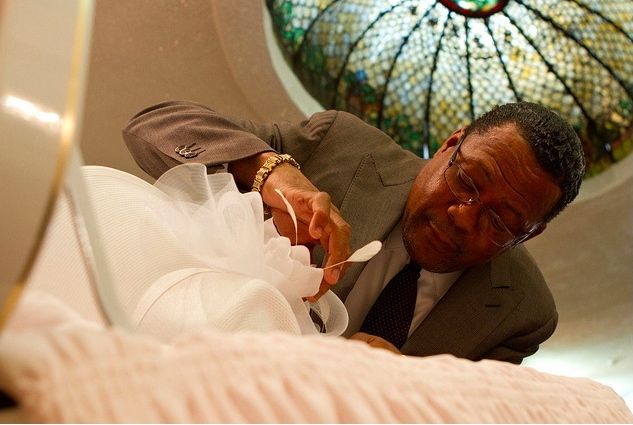 This weeks blogroll links to an article and documentary film, “Homegoings” about black funerals. The film brought on a rush of memories of Sunday mornings with my father on Seventh Avenue in Harlem. The owners of the three funeral parlors, Grifffin-Peters, Rodney Dade and Claude Sterrett were my father’s neighbors and friends. Watch Homegoings – Trailer on PBS. See more from POV. Daddy managed the Hot Cha bar, so we first went there, then headed next door to Smalls Paradise, the jewel of Harlem’s nightclub-bar scene. Next on the list was visiting Mr. Sterrett’s funeral home. His daughter, Claudette, was usually with her father, so the two of us quietly played in the parlor, where the bodies were on view, awaiting mourners to pay their respect. My Sundays were unusual because that was Daddy’s visiting day with me and, not being used to children, he didn’t always know how else to entertain me. Daddy and I spent many Saturdays and Sundays on this turf, eating at Frazier’s, visiting funeral homes, and bar hopping before they opened to the public. Our first stop was his bar, the Hot Cha, where urban legend has it Billie Holiday was first discovered. Other venues also claim that honor, including the Apollo, so it might depend on what “discovered” means. On those bar mornings, Daddy tallied receipts, took inventory and said, “Just a little longer, baby,” then made his bezillionth phone call. I passed the time spinning on a bar stool and playing some of my jukebox favorites like Ruth Brown’s He Treats your Daughter Mean, because Jack had taken me to the Apollo to hear her sing it live. Without understanding the allure of alcohol, I wondered what made adults keep returning to these smelly, smoke-filled saloons whose only attractions I counted were the jukeboxes and maraschino cherries I picked off from behind the bar. When Daddy finally finished calling and counting, we walked next door to Smalls. Smalls Paradise was still a fashionable night club with a spacious dance floor that featured talented musicians and hot jazz or blues singers like Joe Turner, Helen Humes and B.B. King. But at 11 o’clock on a Sunday morning, without laughter and music, Smalls had the same beaten down look as its used-to-be-famous neighbor next door. Inside Smalls’ big boxy space, I repeated the same pattern with a new Coca-Cola and a fresh fistful of nickels for the jukebox. Part of Daddy’s parenting style consisted of showing me off in my fine clothes. I performed the adorable daughter routine and liked his friends who were all more lenient than he was, especially the manager of Smalls’ who turned on the stage mike for me. “Jeanie, sing us a song,” he said. “Let me see what you got. If you’re good, maybe I’ll give you a job. I heard you playing Ruth Brown in there. Do you know her song, Teardrops Falling from my Eyes? “Yes. No, not really,” I said, starting to get nervous. That was a good, bar-hopping morning but the better stops were at Griffin-Peters, Rodney Dade or Claude Sterrett’s funeral homes. A common saying around Harlem was “Cry at weddings and laugh at funerals” and as far as I could tell, that’s the way things were done. Mom and Jack’s wedding was a simple affair with about ten guests. She wore a short pastel blue dress, got a little teary and Jack sweated a lot. Grammy didn’t look too happy, but she wasn’t the crying type. Mourners didn’t stay sad long after a funeral and nobody waited to be invited. Folks poured in from near and far, then stuck around for two days or a week, sleeping on couches, grieving over food and whiskey, engaging in joyous talk and praising the Lord for ending their loved one’s troubles and taking them to a better place. Mr. Sterrett’s daughter, Claudette, taught me not to be afraid of dead people. She was my age and if she was spending the day with her father, we played inside, while our daddies talked on the sidewalk. Claudette was better at amusing herself in her father’s place of business than I was. But to be honest, possibilities for play are endless in a funeral parlor. It’s cleaner than a bar, the floor is dry and there are no rules against rearranging folding chairs, or building doll houses out of paper fans or the boxes they’re stored in. Two little girls quietly going about the business of childhood was not the worst thing to happen in the presence of the dearly departed, or apparently that was Mr. Sterrett’s view because we played right there in the room with dead people. Claudette grew up in funeral parlors and knew not to point, gawk or talk about the deceased. I followed her lead. My friend Bunky hadn’t died yet, so what I observed at Mr. Sterrett’s fit neatly into life’s natural cycle: an elder lying in repose before visitation later that afternoon. Not being afraid and not being fascinated by death are two different things, so I won’t pretend I didn’t take peeks. I understood why the dead person wore makeup and that someone applied it, just like Mom painted my face with lipstick and rouge for Halloween. The puzzle in the funeral process was clothes. How did a dead person, who couldn’t raise his arms or legs, get into the fancy clothes? Piecing it together, I concluded Mr. Sterrett dressed bodies the same way he would cover a dining table. He cut the fancy evening gowns, jackets or pants up the middle in the back and just kind of laid the clothes on top of the body.